The first ever Pride in Science event took place at Wilfrid Laurier University this past Monday Nov. 12, 2018. The event was held by the Rainbow Centre and Sarah Scanlon, sexual violence response coordinator at Laurier, who teamed up with Megan Larsen, a post-doctorate in biology, to organize the the event, with the aim of having a group-directed discussion on being LGBTQ+ while studying science. The event took place last Monday in the Science Building, which was a convenient change for students who wanted to attend. Usually, pride events are held at the Rainbow Centre or near-by, which can make it difficult for busy science undergraduates to get involved. 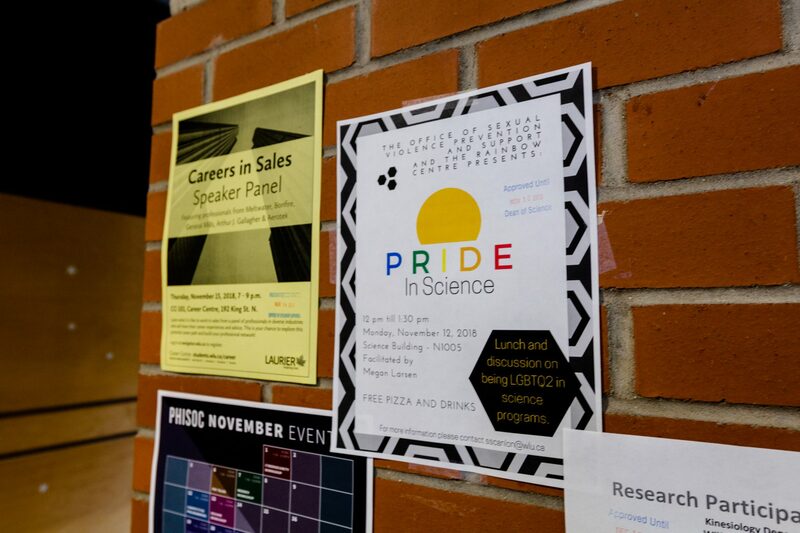 Larsen had initially approached the Rainbow Centre in order to create the event and bring LGBTQ+ students together to have a conversation about their experiences in science, which also became a step in the right direction to connecting folks with resources they may need and not always see. “A lot of the time folks in science tend to end up very isolated in their specific buildings and in their specific areas of campus so they aren’t likely to come across a lot of Rainbow Centre events or a lot of supports for LGBT folks,” said Milas Hewson, administrator for the Rainbow Centre. Hewson continued, noting how the event could be used to encourage LGBTQ+ students to participate in STEM and share their experiences. “STEM is sometimes known for being a very difficult place for women, LGBTQ folks and people of colour to navigate,” Hewson said. Indeed, many of the students who participated in the group discussion gave voice to a similar narrative. The reality is, science can be quite a competitive department, where students are under a lot of stress. Unfortunately, some students feel the need to one-up their competition through discrimination against those they know to identify as gay or queer, instead of supporting one another. Despite these negative experiences, the group spoke positively about being in science as well and the event was greatly appreciated as an opportunity to meet other queer folk who are interested in science. The event provided many resources and supports and introduced the students to academic scholars they could rely on, such as Scott Davidson, from the department of geography and environmental management at the University of Waterloo and the facilitator herself, Larsen. Larsen began the discussion by stating that it is much easier for people to succeed in the sciences when they feel comfortable in their own skin. There should be no need to turn off a certain key aspect of yourself in order to succeed. Stereotypes of how scientists should look and act come into play, as often the image of straight white men come to mind. Scott Davidson introduced a project during discussion called “500 Queer Scientists.” This campaign seeks to represent the diversity of queer people in the STEM fields and dislodge the stereotypes that may surround them. The project accepts contributions and also provides validation for STEM students by doing so. “It would be nice to do it on a regular basis, I think. I haven’t put much thought into it as a continuing series, but this one came to fruition because Megan actually approached the Rainbow Centre and wanted to get involved and have conversations about LGBT folks in science,” Hewson said.